Finally! To little fanfare, the US Army has just released an official statement attributed to an anonymous Senior Army Spokesperson (yes, I’m not kidding, no one put their name on this) that they’ve adopted the Scorpion W2 camouflage pattern for use as the Operational Camouflage Pattern. This means that Scorpion W2 will supplant the MultiCam pattern which was adopted as OCP into 2010. In addition, it will also replace the Universal Camouflage Pattern adopted in 2004 as the primary Camo pattern. The printers are rolling Scorpion off the line like so many $100 bills at the US Treasury. There are no new details in the statement that have not already been disclosed by Soldier Systems Daily. The timing for sale of the items in the new pattern in Summer 2015 is in line with the May 2015 goal stated to industry last month. Despite this announcement, which occurred after duty hours on a Thursday evening, the Army has still not released any photographs of the Scorpion W2 variant which was modified from the baseline Scorpion circa 2010. So far, everything you see online that is labeled Scorpion is not the W2 variant adopted by the Army. As both the commercial MultiCam and Scorpion W2 are variants of the original Scorpion they all have very similar shapes and colorations but are distinguishable when laid out side-by-side. In fact, both the Scorpion and MultiCam patterns were developed by Crye Associates while the Scorpion W2 modification of the pattern was conducted at the US Army’s Natick Soldier Systems Center in Massachusetts. See our article soldiersystems.net/2014/05/23/little-scorpion-camo-history for additional background. ARLINGTON, Va. (July 31, 2014) — The Army has selected a pattern as its base combat uniform camouflage pattern. The Army has confirmed through testing that the pattern would offer exceptional concealment, which directly enhances force protection and survivability for Soldiers. The Army is naming the pattern the Operational Camouflage Pattern (OCP) to emphasize that the pattern’s use extends beyond Afghanistan to all Combatant Commands. The Army’s adoption of OCP will be fiscally responsible by transitioning over time and simply replacing current uniforms and equipment as they wear out. This article was updated to add details on the history of the a Scorpion camouflage pattern. I’ve always thought that these Blue Force Gear ties were quite smart, particularly the Coyote and Urban Wolf models. Naturally, there’s a MultiCam version as well for those of you who can spice things up on casual Friday. Made from 330 Cordura with a red BFG reticle at the bottom of the tie . Geissele Automatics’ own Bill Geissele demonstrates the new Super Sabra trigger for the Israeli Tavor. It is a derivative of the popular SSA trigger, and will have a similar pull and feel around 4.5 lbs. Post by Geissele Automatics, LLC. That mark on Bill’s face is the exhaust from the use of the SilencerCo Saker556 suppressor. Geissele has stated that the ambidextrous ejection port was not completely seated allowing some gas to escape. KETCHUM, ID (July 29, 2014) – Whether you’re hunting big game, posted up in a duck blind or stealthily entering enemy territory, SMITH Elite has your vision protected with MilSpec level impact resistance wrapped in the most effective camouflage patterns used today. Featuring designs from Realtree®, Kryptek and Multicam® across four frame styles, SMITH Elite offers a variety of tactical protection solutions to dissuade and disguise visual detection. Debuting this summer, the new Drop Tactical sunglasses (MSRP $199) provide maximum frame coverage in impact-resistant materials, including polarized brown high impact lenses to keep fast moving debris and light out of your eyes. For the avid huntsmen, SMITH features frames in Realtree A/P® camo – a neutral, open, realistic, versatile and effective pattern. For bird hunters, the frame is also offered in Realtree MAX-4® wetlands camo, providing maximum effectiveness as waterfowl camo in any open terrain and without geographical limitations. Additional styles featuring Realtree A/P and Max-4 patterning include the Hideout Tactical (MSRP $95-140) and Hudson Tactical (MSRP $95-140) frames, with 3 lens options available. Specially designed for varied geographical regions and elevations, SMITH is also utilizing Kryptek Highlander™ patterns to increase stealth when pursuing a wide range of quarry in mixed terrain. For use by military and hunters alike, Kryptek Highlander is available with gray MilSpec rated lenses in the Hideout Tactical, Hudson Tactical and Prospect Tactical frame styles (MSRP $179 each). For military and law enforcement personnel, SMITH offers Kryptek Typhon™ and Multicam® patterning. Ideal for night missions and featuring a black and gray snakeskin design, Kryptek Typhon serves those who operate when and where others will not venture. The MultiCam® pattern was developed to effectively limit the visual signature of a person operating across a very wide range of physical environments and seasons. The official issued pattern of the US Army for all Afghanistan operations in 2010, MultiCam blends a variety of neutral hues to allow the overall appearance to change from green to brown tones in different areas of the fabric, while having smaller blotches to break up the bigger background areas. Kryptek Typhon is available in the Hideout Tactical, Hudson Tactical and Prospect Tactical frame styles with MilSpec impact resistant gray lenses (MSRP $179 each), and the MultiCam is offered in the Prospect Tactical frame (MSRP $179). All styles feature 8 base lens curvature for full eye protection, impact resistant lens and frame materials (meets ANSI Z87.1 and MIL-PRF-31013 Clause 3.5.1.1) and have hydrophilic Megol temple and nose pads that gently adhere to the skin when reacting to perspiration and moisture. Last week, Program Manager (PM) Special Operations Forces (SOF) Survival Support and Equipment Systems (SSES) issued a Request for Information For Jungle Uniform Development and Evaluation Materials. Specifically, they are conducting market research to identify candidate materials for use in hot wet climates (tropical to jungle). I’ve gone into quite a bit of detail regarding the US Army’s interest in similar fabrics earlier this year so feel free to go check that out here if you are interested in some additional background. The jungle uniform, in a design to be determined, will consist of a jacket, trousers and cap. The evaluation is to identify performance parameters of both materials and design to meet user identified needs to include moisture management, comfort, insect protection, signature management and compatibility with individual equipment. Testing will be conducted by equal number of evaluators for each design including field evaluations in various tropical jungle environments while conducting military tasks. At the completion of field evaluations users may determine the acceptability of each uniform. Upon completion of testing one or more designs and material may be selected for production to meet the current requirement and a production run then executed. An optional block two evaluation, if needed to refine desired characteristics and performance, will be conducted by users again in tropical/jungles environments conducting military tasks. NIR or ability to be met. Available print patterns and or ability to be printed. Colorfastness to laundering, light, and perspiration. Respondents that believe they can provide materials that meet the Government’s performance requirements are invited to submit material samples with their written responses. These samples will be degraded or destroyed during evaluation and will not be returned to the respondent. In addition, the respondent must provide the following information on the submitted samples. 1. A material description, fiber blend percentages, and Berry compliance documentation. The supplier must identify the performance of the submitted material. 2. If a supplier submits multiple materials, it is requested that they identify the advantage/disadvantages of their competing products. 4. Submit minimum of one (1), but preferably five (5) linear yards in any color. If you’re interested, you’ve got until 28 August to respond. I’m sure they’ll also be checking out what’s available at next week’s Outdoor Retailer Summer Market in Salt Lake City. For full details visit www.fbo.gov. I had the pleasure to meet and speak with David Lyon several times over the past few years. We weren’t close but he made one hell of an impression on me, every single time. What a great young man. In fact, we were just talking a couple of weeks ago about a story on his latest endeavor, a new Vodka. Initially, I met him through a mutual friend and then found out about his company Forward Solutions LLC, which specializes in EOD equipment. You see, David was a Marine EOD technician and as you can tell from the photo below, he was a Wounded Warrior. He might of lost his legs to an enemy IED but he didn’t lose his heart. He stuck in there, maintained a great attitude, worked with other wounded Veterans and used his head to come up with new solutions for his EOD brethren. All laudable actions. I was humbled when we’d talk. We announce, with sadness that David Lyon passed away today at approximately 2pm from sudden heart complications. His family was able to be with him as he peacefully left this world. We plan on having a memorial in San Diego and he will be laid to rest at home in Utah. We do not have details yet but will inform everyone as soon as arrangements are made. Dave was a incredible man and touched many lives in great ways. Rest in peace Dave, you were an amazing father, son, brother and friend. You will be missed and never forgotten! What a blow. The enemy couldn’t get him but the wounds of war hit their mark. I’m glad he passed peacefully with family, but I’m sad he’s gone. NEWINGTON, N.H. (July 31, 2014) — SIG SAUER® has launched a redesigned webstore, offering an expanded selection of SIG SAUER branded clothing, merchandise, accessories, and a new line of Mitch Rosen designed holsters. The SIG SAUER webstore has always been the premier online resource for factory parts and accessories. Now fans can show their affinity for the SIG SAUER brand with a selection of men’s and women’s shirts, sweatshirts, hats, and drinkware. In addition to new clothing, SIG SAUER has partnered with Mitch Rosen Extraordinary Gunleather to provide a line of SIG SAUER-specific holsters, including hard-to-find holsters for handguns such as the SP2022®, 1911, P320, P250® and P290®. Right- and left-hand models are available in most patterns. “Mitch Rosen is one of the top holster manufacturers out there, and we’re excited to offer these products,” Creamer said. While many of the products in the webstore are new, Creamer said they are just the beginning. 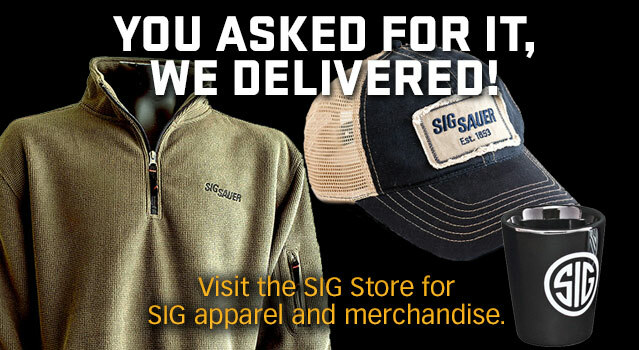 Edit: SIG Sauer has revised their shipping rates for SIG apparel. They’ll be cutting shipping to $9.95 and offering free shipping on all order $100 or more.